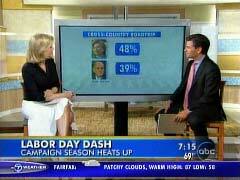 On Tuesday’s "Good Morning America," George Stephanopoulos showcased a "quirky" poll indicating that Americans would like Hillary Clinton next to them for a multi-hour, cross country drive. Additionally, according to anchor Diane Sawyer, the poll also found a majority of citizens would choose the New York senator to run the company that employs them. Stephanopoulos, host of "This Week" and former top aide to Bill Clinton, spun the good news for Hillary as getting "at what people are looking for in a president." The two ABC anchors also discussed Senator Clinton’s attempts to increase her likability ratings. Stephanopoulos repeated a talking point by parroting the former First Lady’s claim to be "the most famous person in the world that people don't know." Then, he helpfully played clips of Mrs. Clinton demonstrating warmth and humor on such venues as "The Late Show" and Ellen Degeneres’s program." Finally, what little time was left for the Republicans was spent bashing former Senator Fred Thompson for "fritter[ing]" the summer away and not exciting crowds. Before ending the segment, Stephanopoulos took a few swipes at Fred Thompson and his impending entry into the race. According to the ABC host, Thompson, "frittered away some excitement" this summer, has thus far has not "excited crowds" and only has "about a week" to show his strength. This is the second time in three days that Stephanopoulos has slammed the former Tennessee senator. Last Friday, he derided Thompson’s speeches as "flat" and prophesied that the Republican candidate would never "catch up on organization." Diane Sawyer: "Now to the race to 2008. Here is a statistic that caught our attention. When Bill Clinton first ran for president in 1992, he had spent $20,000 by this point in the race. His wife, Hillary Clinton, Senator Clinton, has now spent $20 million and today is the official kick-off of the campaign. Chief Washington correspondent, host of ‘This Week,’ George Stephanopoulos joins us with the bottom line. Good morning, George." Sawyer: "Here we are, four months to go until the big race. First of all, I can't imagine what they are going to do, the pace they are going to keep." Stephanopoulos: "Well, you know, Robin was saying this was the first day of school. These guys didn't get a summer break. They went all through the summer and for the next four months, the next 120 something days, it is going to be double time." Sawyer: "Let's talk about the to-do list, starting with Hillary Clinton. One of the things that they wanted to get done by this point was this likability issue. Her national polls shows that she's got almost double Obama's numbers, but the likability question is key?" Stephanopoulos: "She says that she's the most famous person in the world that people don't know. So what they try to do in this first phase is put Hillary Clinton in warmer, more personal more intimate settings. Take a look." Senator Hillary Clinton (On "Ellen Degeneres Show"): "Let's start with this, which is Running For President For Dummies. I read it. It's very helpful." Ellen Degeneres: "And I'm on the cover." Clinton: (Eating ice cream): "I was told that you can get everything on a stick." David Letterman (on "The Late Show With David Letterman"): "It's true in college you were a Republican?" Clinton: "I was. I was. Yeah, I was." Letterman: "What lead you to the– People gasping!" Clinton: "I think somebody fainted in the third row." Stephanopoulos: "This is a strategy that worked for Hillary Clinton in her senate run back in 2000-2001. They think it will work again." Sawyer: "And we told everybody we had a quirky, kind of, little poll. Couple of questions we want to ask that you might ask at home. One question, which candidate would you like to drive across country with of the Democrats. Take a look at this. Look who won. Hillary Clinton. 51 percent of you said that you would rather drive across country with her. Obama 22. Edwards 14." Stephanopoulos: "It shows the strategy is paying off for Hillary Clinton, number one. It also shows, though, she's the most famous candidate far and away." Sawyer: "Most famous. So, in the next four months what does she have to do to hold on to that lead with Obama now chipping away at her?" Stephanopoulos: "There were a pair of dueling sound bites over the weekend that you have to take a look at to help illustrate this." Clinton: "Change is just a word if you don't have the strength and experience to make it happen." Senator Barack Obama (D-Ill): "I might not have the experience Washington likes but I believe I have the experience America needs right now." Stephanopoulos: "That is the fight for the Democratic nomination in 15 seconds. Hillary trounces all of the other candidates, Barack Obama, John Edwards on the issue of strength and experience. She thinks that she has to convince the voters she can bring about change in Washington. And you see, both Barack Obama and John Edwards hitting at that. That’s what they will focus on in the next four months, saying she can't do it." Sawyer: "Quick question now about the Republicans and Giuliani, who is also ahead substantially. But there’s something called a Labor Day lock for the Republicans, whoever is ahead on Labor Day, today, should win the nomination?" Stephanopoulos: "Going back to 1952 every single Republican who had the lead on the Labor Day the year before the election got the nomination." Sawyer: "And yet Thompson is getting in the race today, former Senator." Stephanopoulos: "He's getting in this week. He had a tough summer and probably frittered away some excitement he had. What he's got to do is prove in the next week and he's only got about a week, that he can perform as well on the campaign trail as he does on television. He hasn't excited crowds yet." Sawyer: "All right. Let's take a look though, before we let you go because we promised you the answers to our national poll questions. We did match up Hillary Clinton against the front-runner Rudy Giuliani on our two little questions that we asked everybody. If you were driving cross country and you had to choose between Clinton/Giuliani, the results? 48 percent said Clinton on that drive across country. 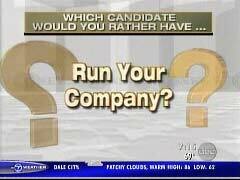 And if you were picking someone to run the company, where you are heading back to work today, whom would you pick there? Well–"
Stephanopoulos: "That’s on the Republican side." Sawyer: "This is the Republican side. It would be 45 percent for Hillary Clinton, against Giuliani. 45 percent to 42 percent." Stephanopoulos: "And, you know– This almost perfectly tracks the head-to-head match-ups next year if you put Rudy Giuliani versus Hillary Clinton in the general election those numbers are almost a perfect match-up. Those two questions we ask actually get at what people are looking for in a president."